Should have turned the car off and waited for summer to arrive and get a 77F day in there too. Ha ha ha! You are your father's son. GEEK! Blood, would have given him a chance for another 176 post before this post too. Maybe 777 is the new 666? Car looks like it might be a beast. 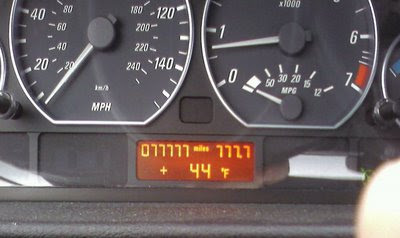 I never get that many miles before I end up trading in to perpetuate my debt slavery to the BMW gods!!! Question, did you play poker and if so, how much did you win????? Going to Vegas Saturday, yee haw!!! BTW, I told my chick to call you. Did you get a chance to speak? Let me know. Check out www.geekynumbers.com ... We would love your photo...it is full of them..